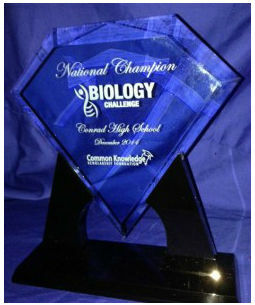 The High School Biology Challenge is a biology scholarship and team competition offered by the Common Knowledge Scholarship Foundation (CKSF). Each month there is a new quiz that corresponds with the the College Board curriculum guide. If you are heading to college after high school, you should participate in this scholarship. Even if you don’t win the scholarship money, each month you will be reviewing the core content for college level biology. The High School Biology Challenge is also a team competition. Each month CKSF sums up the top 20 scores at each school and this becomes the school’s team score. Twice a year, in December and May a national champion school is declared and the national championship trophy is sent to the winning school. All high school students should participate in this scholarship, it is easy, it is fun and it turns an academic topic into sport! For complete information including dates and topics for each monthly Biology Scholarship Quiz CLICK HERE. This entry was posted by Daryl Hulce on Monday, July 27th, 2015 at 11:45 am and is filed under Blog Post. You can follow any responses to this entry through the RSS 2.0 feed. Both comments and pings are currently closed.